After our Schiehallion walk, we travelled on to Inveraray yesterday, so that Tom could take part in the Jail Break (which is a hill race, in case you were concerned). 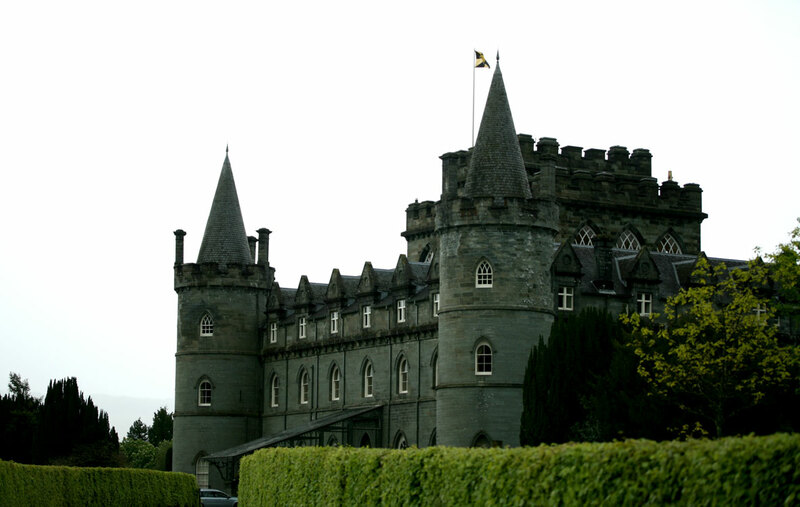 Have you ever been to Inveraray? It is a sort of eighteenth-century equivalent of Milton Keynes or Livingston – a Georgian new town whose “improvements” include a carefully laid out main street and waterside front (which maximised the picturesque potential of the town’s natural situation at the head of Loch Fyne), good access to the loch’s lucrative and famous fisheries, and a woollen mill (no evidence of which can unfortunately be found in the present-day “mill”, which is of the cashmere-sweater-vending variety). Inveraray’s pretty “new” town has been an attraction in its own right since the closing decades of the Eighteenth Century — and, despite the busloads of tourist-buddies, and the relentless tartan tat, I am very fond of its location, and of the neat restraint of its whitewashed Georgian buildings — a restraint emphatically not matched by the architecture the eighteenth-century Dukes of Argyll chose for their seat, which they built on the site of the ‘old’ town. 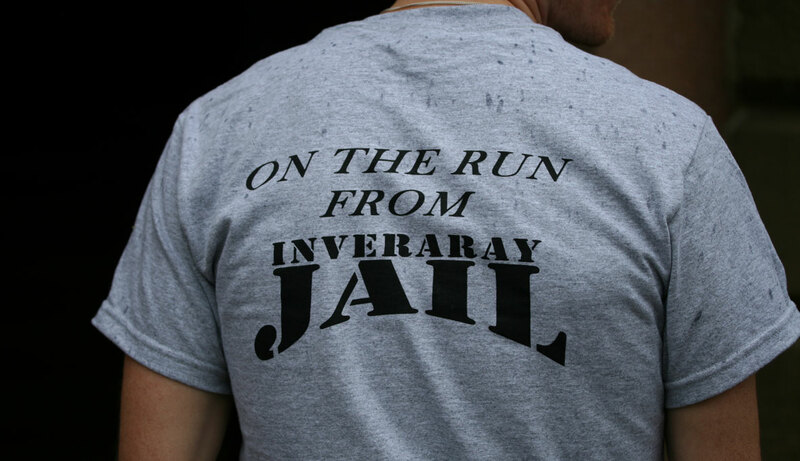 As its name would suggest, the race began at Inveraray Jail (now a popular visitor attraction). 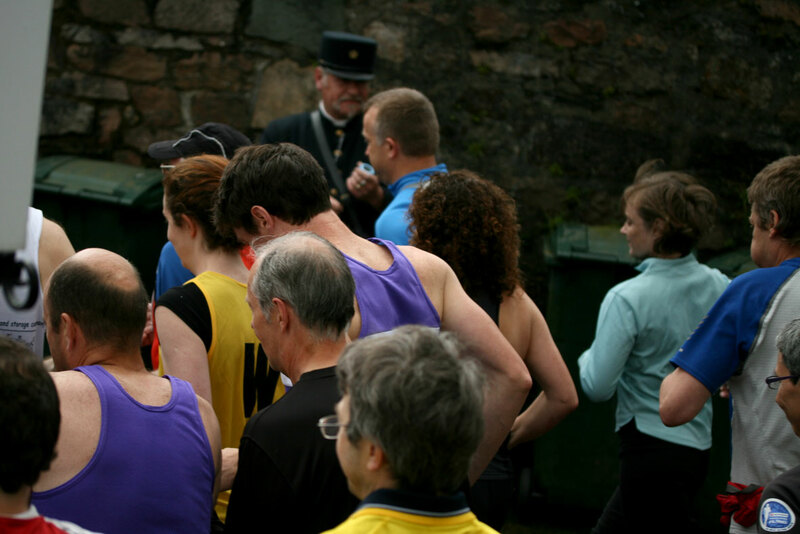 The chap in uniform behind the runners is the inscrutable ‘jailer’. He blew a klaxon, and started proceedings. 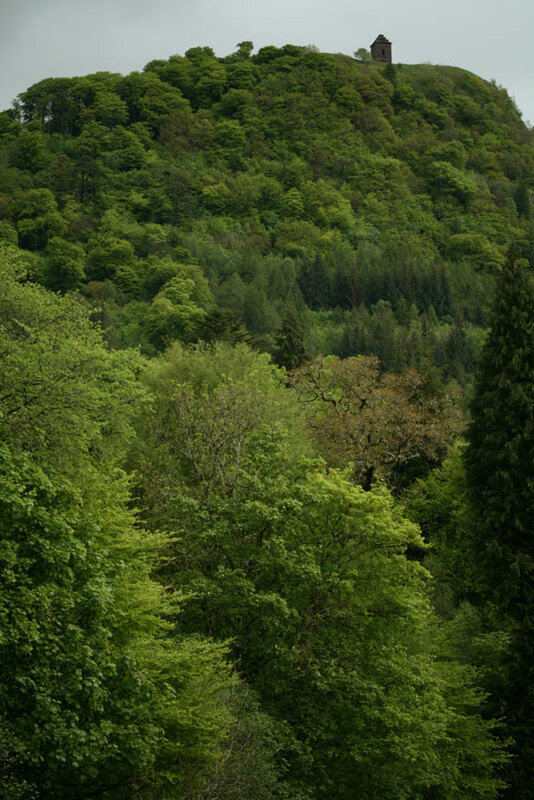 The runners dashed through the town centre and headed toward Dun-na-Cuaiche, a densely-wooded hill above the castle, which is topped by a monument commemorating seventeen prominent members of Clan Campbell, who were executed in 1685 for the part they played in Monmouth’s Rebellion. At a much more leisurely pace, Bruce and I meandered through the castle grounds toward the finish line. The escaped inmate flew toward the finish line. . .
. . .in a very respectable sixth place. Then, after a couple of photographs in the rain. . .
. . . he disappeared in search of suitable refreshment. Just in case you were in any doubt at all, it was an excellent weekend. Well done, Tom, and well done Kate and Bruce! I never knew that the jail was famous! But now I have the song ‘It’s a nice wee in, the Inverary Inn’, running through my head! We used to sing it lots whilst trundling around the Highlands on family holidays. And I now remember my wedding anniversary from that song: ‘… and on the 23rd of June I’ll be on my honeymoon with the lassie from the inn in Inverary’! Cheesy, but true! Who needs a physiotherapist when you have someone like Tom? One day a munro, the next a race. I’m sure he knows better than anyone how to get a wonky leg and foot working at their peak performance. And I’m also sure he’s more fun than a PT. Huzzah for Tom! looks like a great weekend. 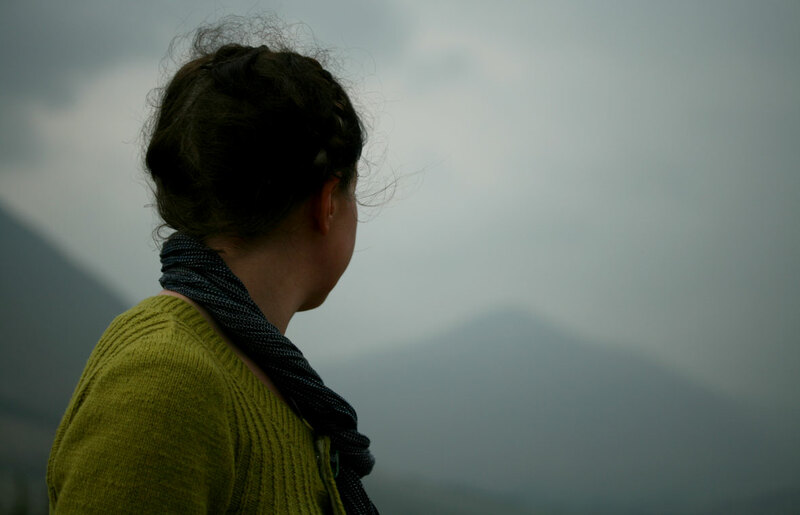 Note to self: get to Inveraray sometime. Oh I do love Inveraray but I’ve only been through twice on a mad cap car chase to catch the Jura ferry. 6th place is amazing! 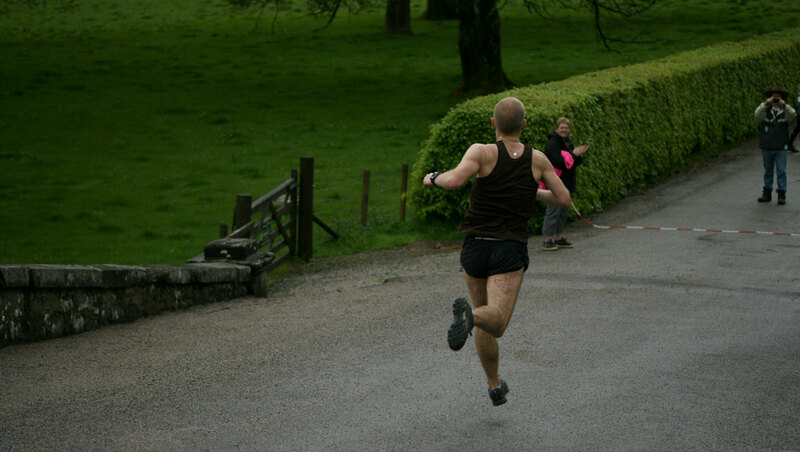 Is Tom doing the Jura Fell Race? – that one always seems particularly bonkers….I’m waiting out for the Music Festival in September! I love the perfect spikiness of the turret tops. To this Texan, you seem to live in a fairyland. Beautiful Schiehallion is just up the road from us and I have never got off my backside to climb it, despite four limbs in working order! You inspire me to do something about that. Good on Tom – what a champ!! Virginia is right…I had to go back and look at the photos – yes his feet do seem to hardly touch the ground – perhaps that’s the secret…don’t run….just fly!! 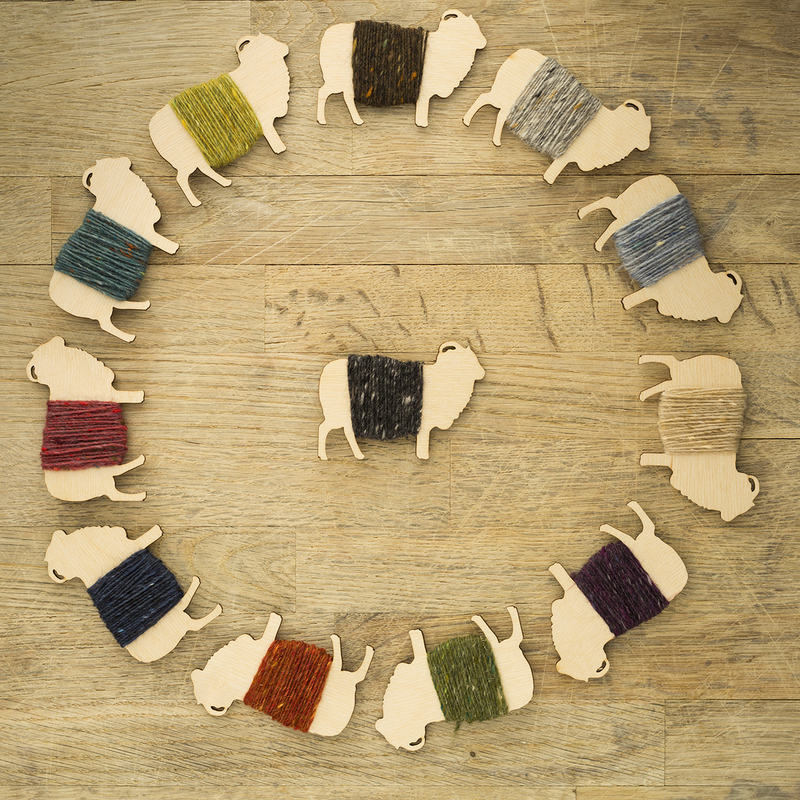 Just started my Deco cardigan – hooray hooray!! First, I think you are such an inspiration. Second, you are one awesome knitter. Third, you write so beautifully. Your blog: so wonerfully written, your pictures amazing! I read your whole blog from the beginning over the weekend. 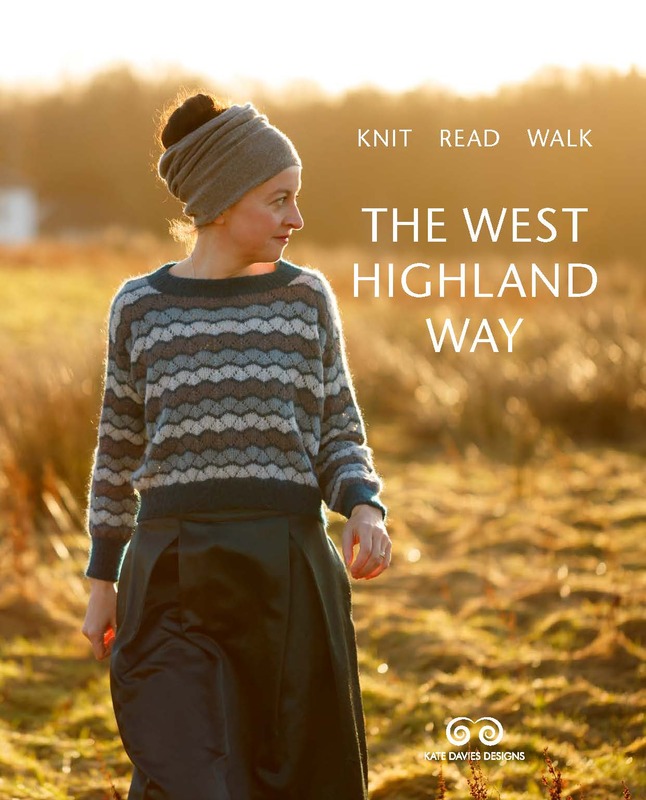 Fourth, Scotland is beautiful, your “walks” stunning. 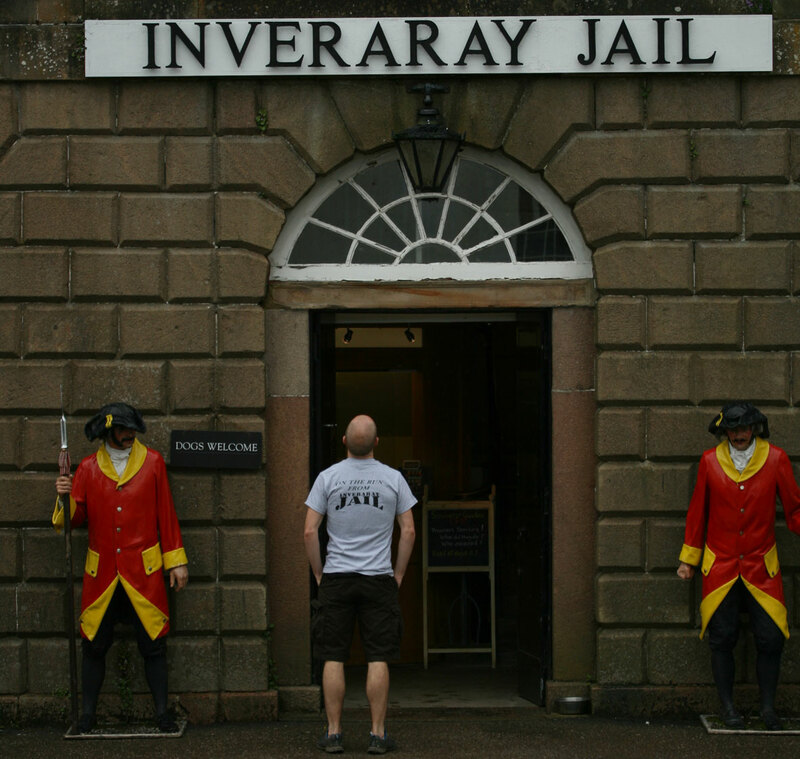 My family went to Inverary on the last Monday Bank Holiday and my 10 year old son was enraptured by Inverary Jail and the “Jailers” who went in for a bit of enthusiastic role play with him. Its a lovely wee town and I was so happy to see these pictures as a reminder. Glad you enjoyed the weekend there. Very interesting, and Tom at 6th place, great’ he must be more of a distance runner. I look forward to when he gets into the right distance for him and comes in 1st! Congratulations to Tom – sixth is indeed very respectable and well worth a wee dram at the end of it! Thank you again for sharing your life, recovery and countryside with all of us. I so enjoy your blog. 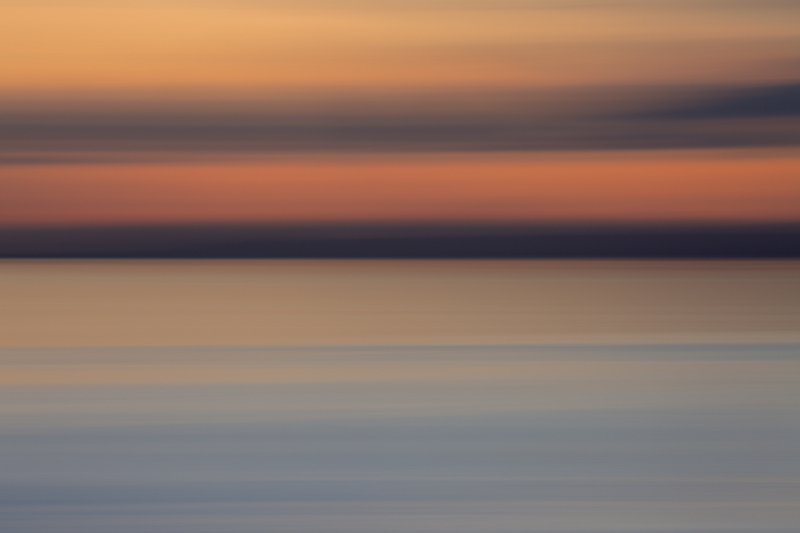 Your photography is inspiring. What fun! I love your posts; getting to see a glimpse of your part of the world is such a treat! And you had an opportunity to wear Deco! It looks great. Looks like a fantastic weekend! Wow, that shot of Tom running toward the camera is amazing. He looks like a jack rabbit or some flying deity from the Ramayana. Like his feet only touch the ground on special occasions. Must be such an exhilarating feeling to have that energy. Looks like you guys are off to a great summer! An interesting twist on your visit to Inveraray..I live at Claonairigh (clunary) House four miles out of Inveraray at Bridge of Douglas at the site of the two old Woollen Mills. One is still there albeit without a roof…something we hope to remedy if every we manage to gather together enough money! Glad Tom enjoyed the race. Great Johnson quote! And lovely sweater. So glad you didn’t miss the whisky shop! One of the best in the country. 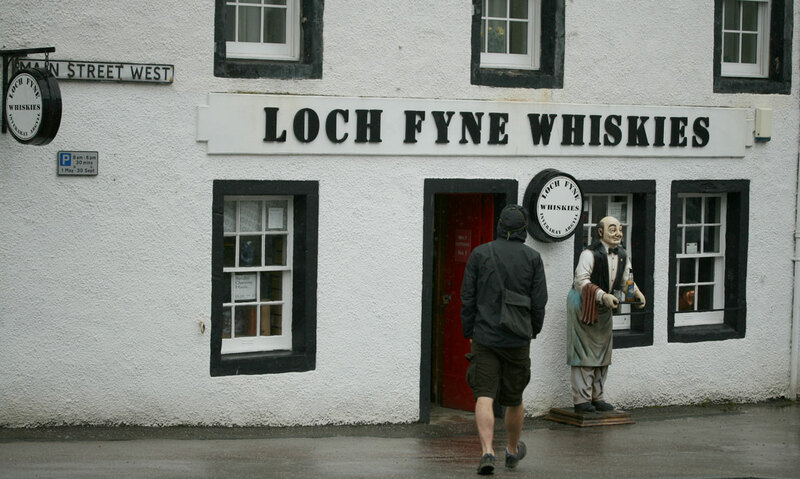 The first time we went to Inveraray Loch Fyne Oysters was a tiny shack by the side of the road, so it was many moons ago. Lovely place! If you aren’t being paid by the Scottish Tourism Board, you should be! Every post about another fabulous walk or trip brings me closer and closer to booking a flight! Thanks, Kate for another two lovely posts. I’m seeing parts of this beautiful world that the tourist blurbs never seem to show.